Bodrum, often called the Saint Tropez of Turkey is a holidaymaker’s dream. Selling a hedonistic lifestyle, seen no-where else in the country, white sugar cube houses dotted around the hillsides are its signature slogan. The iconic status of these old buildings sits at the heart of local memories as long-time residents remember their roots and generations before them. The dwellings tell the story of bygone eras when Bodrum was nothing but the poor man’s fishing and farming village, and they reflect its cultural heritage in a way that no mascot, symbol or mass tourism campaign could. Complementary blue doors and windows add a touch of colour to the whitewash stone walls and one look inside, shows they were built for practicality, not luxury. However, this style slowly evolved over time. A 2011 report called “Traditional Architecture of Bodrum: The Factors Generating and Affecting the Architectural Culture and Identity,” reports three forms of old stone houses on the peninsula. The Kule (Tower) style often appeared in Ortakent while farmers mostly built the mezzanine and the traditional Sakiz house, is the blue and white version we see today. If funds and space allowed it, courtyards were feature points alongside privacy, and small windows. The ability to keep cool during summer but warm during winter was another common architecture requirement. During the 1960s though, building trends were to change again. Tourism took over the region, and with it, a mass of multicultural influences washed over the peninsula. People wanted more space, comfort and luxury. The real estate market had stepped up a gear and as it became Turkey’s version of Saint Tropez, world-renowned and esteemed Turkish architects looked to have their work appear on the peninsula. Richard Meier, a highly respected architect, is known for his clean-cut, simplistic designs that have appeared in landscapes all over the world. He applied the same principle, to the 21 houses he designed in Yalikavak, a resort that shot to fame in jet-setting circles because of its esteemed mega yacht marina. 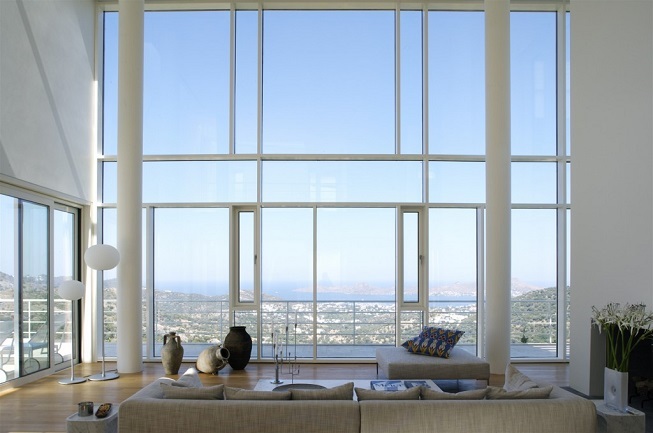 For further information of Richard Meir Bodrum Homes, see here exclusive designer property for sale in Bodrum. Designing each house to sit on a one-acre parcel, they also maximise views from all angles, which is a must, given the spectacular coastline scenery. Tell-tale signs of his work include the cubic exterior, large areas of glazing and copious amounts of skylights. Although designed to let in natural light at every opportunity, he also wanted to shade them from the summer sun. Focusing on minimal, but elegant details and a reduced palette of materials, his work is easy to spot because the colour white predominately runs throughout the exterior and interior décor. Designed by the esteemed Emre Aralot Turkish architecture group, these luxury waterfront villas for sale in Bodrum Town have two key themes running through them. The first is that rather than just be one unit with individual rooms, they designed the villas according to the landscape topography. This produced a fragmented floor plan, of which sections of the house are linked by walkways and courtyards. Second, while the architects have used straight lines instead of contemporary curved exteriors, the exterior panels open, therefore merging the exterior and interior spaces into one. Stone, wood and marble complete the blend of building materials used to present a unique design, found no-where else. If you are searching for off plan or constructed properties, the most frequent style you’ll see is a combination of different eras, styles and genres. The latest trend is to honour bygone days, with the spacious comfort of today’s houses by combining traditional Bodrum architecture with modern finishing. 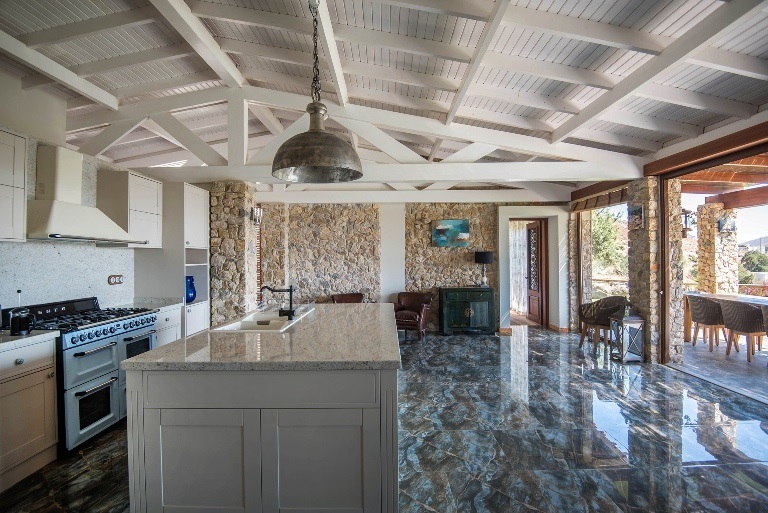 This luxury stone built Turkey real estate for sale in Bodrum has it all. It’s a hard task for even the most experienced of architects but when done right, it’s a perfect blend of quaint nostalgia. Think stone walls, wooden balconies, and vaulted ceilings combined with en-suite bathrooms, marble kitchen worktops and the latest in SMART home technology. An ideal house for reflective people who still want to live a modern lifestyle. To see more architectural styles of the Bodrum real estate market, look at our Bodrum property portfolio and for more details about any specific property, just fill in the enquiry form. Alternatively, call, email or drop into one of our regional offices to speak with a local, and experienced sales representative.